Although cross-border industrial sub-contracting is the main tool of industrial organisation in the global economy, practitioners in this important field are significantly hampered by a lack of uniform rules. This book offers a first step in discerning and formulating a framework for such rules, based on the experience of counsel for both contractors and sub-contractors in over twenty countries worldwide. It consists of the final papers, subsequently revised by the presenters, delivered at a conference held in Florence, in February 2000, under the auspices of the Union Internationale des Avocats (UIA) and the Association Internationale des Jeunes Avocats (AIJA). 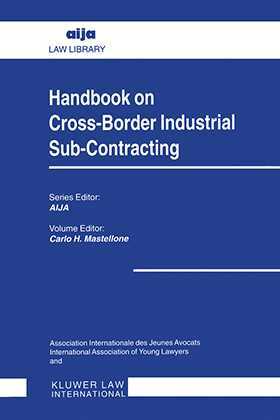 The authors cover a wide range of perspectives and issues that affect the negotiation and drafting of a sound cross-border industrial sub-contracting agreement, including competition law, quality control, product liability, payment clauses, and industrial and intellectual property. Other essays present the basic legal issues from a comparative perspective and clarify the fundamental distinctions in the points of view of the contractor and the sub-contractor. Individual contributions from practitioners in twenty countries (encompassing EU countries, the United States, Central and Eastern Europe, and the Asia-Pacific region) detail applicable domestic laws so that the user can determine points of difference, common aspects, and potential pitfalls in most of the world's major industrial sub-contracting jurisdictions.